A panel of knowledgeable third-party judges with cross-sectoral experience rose to the challenge of narrowing down the brilliant examples of innovation and environmental achievement nominated this year for the uniquely-Albertan award. A maximum of three nominees in each of the Emerald Award categories have been selected as a finalist. Only one per category will take home the award. 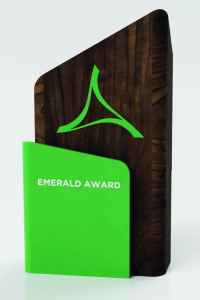 The 27th Annual Emerald Award, designed and created by Edmonton’s OneTwoSix, is made from reclaimed materials. All media is invited to attend the 27th Annual Emerald Awards. Members of the Alberta Emerald Foundation will be on location for interviews.